Golf is a competitive sport and it can work as a great stress reliever too. There are various techniques and shots that are used when playing golf. Among them, one of the most important shots to learn and master is the pitch shot. Knowing more about this shot can seem like a confusing task due to the conflicting information that you may encounter. There are different factors that you would need to balance so that you can control your pitch shot. Getting the pitch shot right and balancing the factors can seem intimidating sometimes. ​Are you are someone who knows how to hit a pitch shot but are having trouble mastering it? Do you want to perfect this shot but don’t know how to do it? 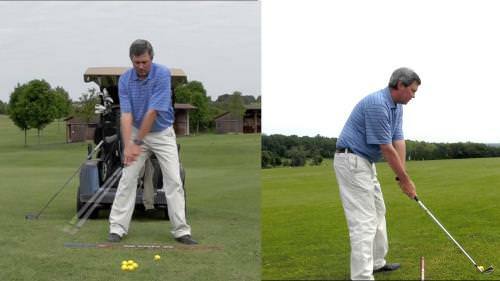 Our tutorial will surely help you understand more about the pitch shot and thus get more versatile. Read on to find out more. A golf club set consists of different clubs and each of them is designed so that it can be used for a different purpose. A golf club set would contain clubs like woods, irons, hybrids, wedges, and putters, etc. How softly the ball must land so it stops near the hole. A golf ball might seem unassuming but it is important to choose the right golf ball. Today golf balls are being manufactured using different constructions. The most common types are one-piece, two-piece, three-piece, four-piece and five-piece. The number used in the type of construction basically denotes the number of layers that have been used in the design of the ball. Golf can be an extremely demanding sport. It can test both your physical and mental capabilities. Not only do you need the right skills, but you would also need the correct attitude for the game. A pitch shot can be defined as a high shot, which is played using a club that gives you the desired loft. It has a steep ascent, a steep descent and works well when you need the ball to travel a relatively smaller distance. This high trajectory shot means you hit the ball more than what you would do for a chip shot but without using the full swing. If you use the normal amount of swing it would end up sending the ball too far. This shot requires the right amount of swing and this can be tricky to accomplish under pressure. One important characteristic is that the ball remains longer in the air that in spends on the ground in an ideal pitch shot. Once you have all the required equipment it is time to try out the technique. The first step is getting the position of the ball right. The ball must be placed in the middle of the stance. The posture can have a direct impact on the result of your shot. Hence care must be taken to get your posture right. The body must be opened up slightly. The stance must be narrow. The width of the feet must be about shoulder width or lesser. When the body is opened up it helps you to swing the clubhead through impact and you can get the desired loft as well. The next important aspect is to position your weight correctly. It is advisable to place slightly more weight on the left side than the right side if you are a right-handed golfer. Ideally, about 70 to 75% of your weight must be on the left side. The knees must be slightly flexed and the position of the ball will be in the middle of the stance. The location of the handle is ahead of the ball, but only slightly. The clubface must be opened a little bit. This means that the clubface must be angled a little bit to your right when you are looking down at the club. After getting the posture right, the next aspect is to keep the strike point in mind for the pitch shot. During a pitch shot, the club head must strike the ball and the ground at just about the same time. In a pitch shot, the player feels that the strike is softer. In this shot since the weight is centered during the stance, it could help the player to strike the ball and the ground more easily. The player is able to use the bounce on the bottom of the club during the shot. The loft of the club is preserved so that more spin is created and the result would be a higher and a softer pitch shot. One main characteristic of the pitch soft is that it feels soft overall. The impact with the ball, the tension in the grip and the reaction of the ball on the greens feels softer too. You would need to hit down on the ball so that it gets up in the air. When the angle of attack is shallow, it can help to improve the quality and the consistency of the shot. Similarly, if you hit down too steeply into the back of the ball, it would not produce desired results. Some players may have a tendency to ‘scoop' or ‘lift' the ball into the air. This will not result in the ball going up but instead, it will go down. One trick that would help you remember this is by keeping the law of opposites in mind. If you hit the ball down, the ball goes in the air. In order to get the swing right, you would have to work on the correct technique for the back swing and the down swing. Each player has his or her own natural tempo. When you try to change that, it could lead to wrong accelerating and decelerating and the shots becoming jerky. The result would be different kinds of errant shots. Changing the pace of your swing is only advisable if you are a skilled player with a low handicap. For all others, it is best to follow your natural tempo for best results. During the backswing, it is important to not close the club face when taking the club back. Try to ensure this whenever you practice by checking that it stays open when the shaft gets parallel to the ground. Another way to help you keep the face open is by hinging your wrists. However, it is important to note that you would not require too much wrist action. 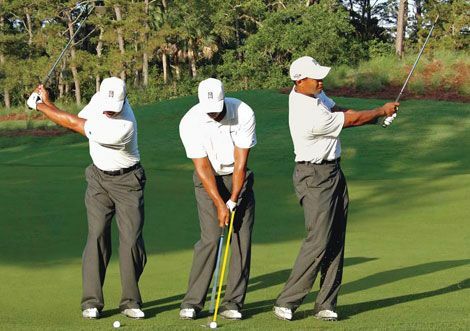 During the downswing, the movement must be done with normal effort and in a smooth manner. The body must feel active when you swing down to the ball. Keep the club in an open position and rotate the body towards your target in order to complete the shot. You must keep the chest turning towards your target and allow the clubhead to swing down the line. The hand and wrist movement must be very little. There are a couple of important advantages if you start with an open clubface. It helps you to get the ball up quickly and the sole of the wedges, with their bulging design, make them more forgiving. When striking the ball, looking at the turf slightly in front of the ball when you swing help you strike the ball in a crisp manner. An important aspect of hitting the pitch shot well is the choice of club. Use a club, which gives you adequate loft. Not only are they easier to hit but the spin element on them is reduced too. Always ensure that you have created the correct posture before you begin. When you stand upright with the bottom straight back, the legs automatically get straightened. As you do this, you have created a nice and correct back angle. Release the knees as you maintain the back angle. You will notice that the arms are now nicely hanging downwards. Keeping the weight on the front foot is important for a pitch shot. It helps you to keep the body during the swing. It also helps to create the backspin that is desired in a pitch shot when you provide the downward blow. The weight must always be on the front foot and not shift to the back foot during any time of the shot. Maintaining consistency is the key to a good performance. When you are able to maintain a consistent pace on the swing you will be able to produce the desired results. Swinging quickly through one shot and slowly through the next would not help to better your performance. The follow through of the shot is important too. It should be at the target with the hands finishing around the middle of your chest. If you stop on the follow through on the shot, then you would come up short constantly. Ideally, the follow through should finish around the 3 o’clock position. While long shots are important for your golfing skills, a pitch shot is equally important. Some of the major differences that set the professionals apart from the amateurs are the type and number of shots that they are comfortable playing. Learning to play and mastering the pitch shot with finesse requires consistent practice. Visualizing the shot before you execute it makes this process simpler. Then you must pick a landing spot and focus your energies on ensuring that the ball lands at the particular spot. Like all other golf shots, it requires the right rhythm so that playing remains enjoyable. Did you find the information in this tutorial useful? Do let us know whether you liked it and how helpful this information was for you in the comments below. Do you have any tips to share about hitting the pitch shot correctly? We would love to know about your experience. Do share it with us in the comments section below.